Pinot Grigio is the Italian name for the wine varietal known as Pinot Gris. The wine is called either Pinot Gris or Pinot Grigio when produced outside if Italy. Make no mistake however, there is a slight difference between the two and some might say they are two distinct varietals. The grapes are generally picked early in an attempt to retain as much acidity as possible. The grape is naturally low in acidity. Sometimes oak barrels are used to add “weight” and vanilla characteristics but usually the juice is fermented in stainless steel tanks. Northeastern Italy remains the leader in Pinot Grigio production. Veneto, Friuli-Venezia-Giulia and Trentino-Alto Adige are some of the more popular areas in Italy where the grape thrives. It is also produced in France and in both Oregon and California in the United States just to name a few areas. Pinot Grigio has particularly found success in the United States as it has leap-frogged Merlot to become the third most popular varietal recently. Light, crisp and dry are just a few adjectives to describe the wine as well as lemon, pear, melon and some sweet and spicy flavors with sometimes a hint of flint on the finish. To no surprise, it can be a refreshing and versatile wine that can match well with light summer dishes including pasta and risotto. Below is a look at both styles of wine and some possible pairings to consider. Wines that are labeled Pinot Grigio are usually made in a crisp and drier style than Pinot Gris. Many times the wine will perform great as an aperitif. Think of light seafood salads like a crab or shrimp salad and even marinated seafood like octopus or grilled green-lipped mussels alone or as part of a ceviche. Another potential outstanding pairing would be a fresh herb salad featuring a light vinaigrette with goat cheese and walnuts. An interesting Mexican pairing could be chicken burritos with black-bean salsa and pepper jack cheese. The heat from the cheese requires a low alcohol, high acid wine to neutralize it. Sushi lovers should not discount Pinot Grigio. It can make a wonderful pairing with both the wine and sushi getting better because of the pairing. Pinot Gris while still being light and crisp can also be made into a rich and rounder wine. This style is maybe more conducive to slightly heavier summer foods. Think of light pasta sauces featuring clams or richer fish like salmon or tuna made with olive oil. Even fresh tomato sauces will work as long as the sauce does not contain meat. Think tiger prawns and a basil tomato sauce. Asian dishes pair particularly well with Pinot Gris as long as they are not over-the-top spicy. Imagine pan-roasted black cod in a mild Thai curry sauce. Milder Mexican dishes also shine, like chicken enchiladas in a verde sauce as long as the verde is not too spicy. 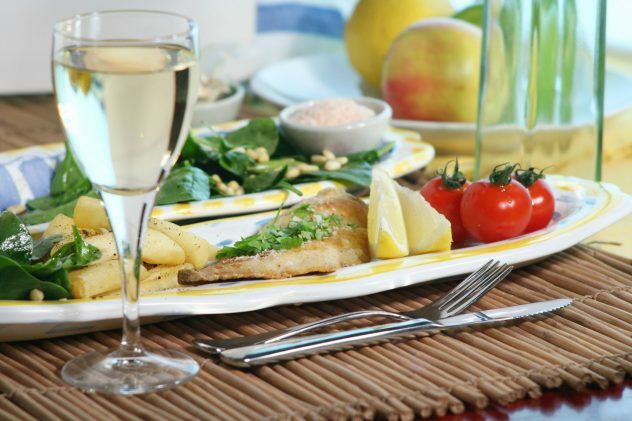 Pinot Grigio and Pinot Gris are truly great wines to pair with a variety of lighter dishes. No matter what sauce you are concocting, don’t forget to add a splash of wine to the recipe.